Kroc is a rare, unseen enemy that is first encountered in Donkey Kong Country 3: Dixie Kong's Double Trouble!, and again in Donkey Kong 64. Squitter and a Kroc target in Donkey Kong Country 3: Dixie Kong's Double Trouble! Kroc appears only in one level in Donkey Kong Country 3: Dixie Kong's Double Trouble! called Krack Shot Kroc. 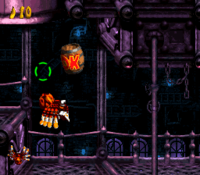 In this level, an aiming cursor, manned by Kroc, will stalk Dixie Kong and Kiddy Kong (who are transformed into Squitter the Spider) throughout a factory trying to blast them with large fireballs. Though Kroc is quite precise in its firing, it can be tricked into blasting the various enemies found throughout the level. The "Bash the Baddies!" Bonus Area in Krack Shot Kroc allows the player to control Kroc's reticle and use it to blast several Re-Koils and Buzzes to beat the minigame. Kroc reappears in Donkey Kong 64. In this game, Kroc first appears in the area Angry Aztec in the five-door temple. Whenever a Kong obtains a Golden Banana in the temple, Kroc's cursor will appear and a menacing voice will yell "Get out!". If a Kong fails to get out of the temple in time, they will be blasted by Kroc and either lose health or be defeated. Kroc later appears in the Donkey Kong 64 areas Creepy Castle and Crystal Caves, inside several of the area's cabins and lodges. In the Game Boy Advance remake of Donkey Kong Country 3: Dixie Kong's Double Trouble, the sound for Kroc laughing menacingly before firing its weapon is a reused version of a Kloak's laugh from the Game Boy Advance remake of Donkey Kong Country 2: Diddy's Kong Quest. The laugh itself was originally used for the villain Baron Samedi in GoldenEye 007, another Rareware title. Kroc is the first enemy in the Donkey Kong Country series to be playable. It is also the first playable character in this series that is neither a Kong nor an Animal Friend. ↑ Munson, Terry, and Paul Shinoda. Official Donkey Kong Country 3: Dixie Kong's Double Trouble! Nintendo Player's Guide, page 77-78. This page was last edited on April 2, 2019, at 20:32.